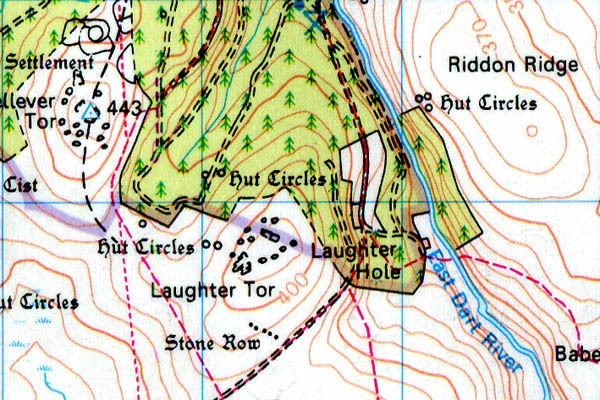 Laughter Tor – Grid ref: SX 653757 Height: 420m a.s.l. Leather Tor – Grid ref: SX 563700 – Height 380m a.s.l. 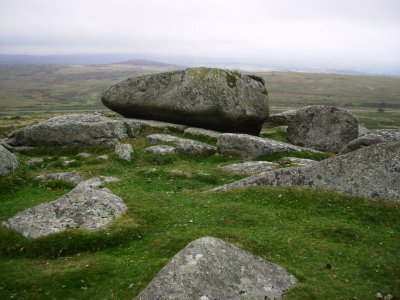 Leather Tor is one the best Tors on Dartmoor for adventure seekers. 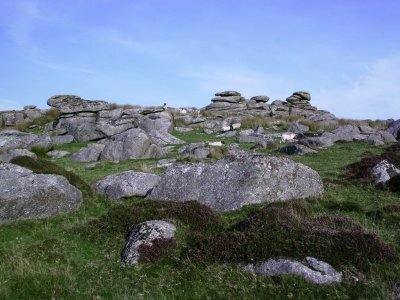 Traversing the ridge of Leather Tor provides a mini alpine experience with it’s steep flanks and uneven ridge line, be prepared to use your hands to steady yourself. It is also home to a small sample of traditional climbing routes from Very Difficult to E4 6a. 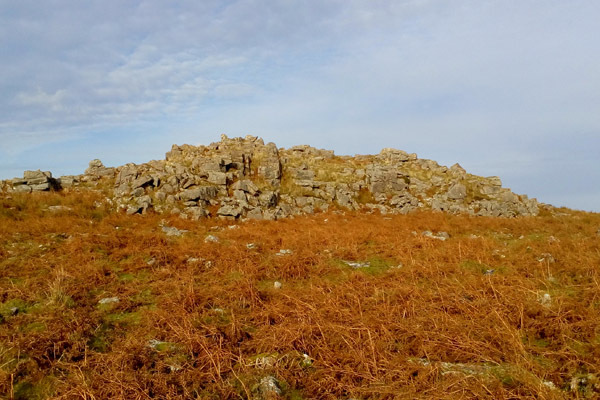 Leedon Tor – Grid ref: SX 563718 Height: 389m a.s.l. Leedon Tor is located just off the spot height of 389m. 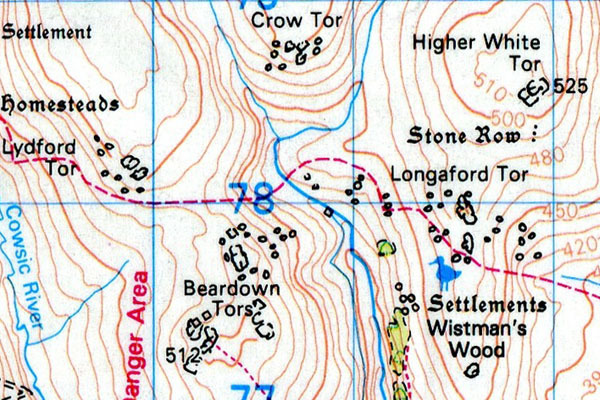 Legis Tor – Grid ref: SX 571656 – Height 310m a.s.l. 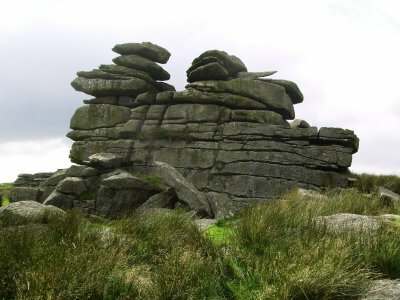 Legis Tor (near to Gutter Tor) is an unremarkable tor due to its fractured nature. It does however provide great views across to Little & Great Trowlesworthy Tors. 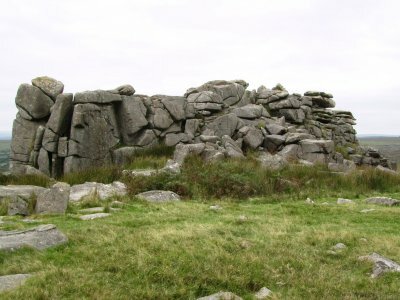 Legis is more of a jumble of fractured blocks and boulders than a distinct set of rocks but none-the-less it does appear quite impressive from its’ approach via Cadover Bridge and the Brisworthy Burrows. 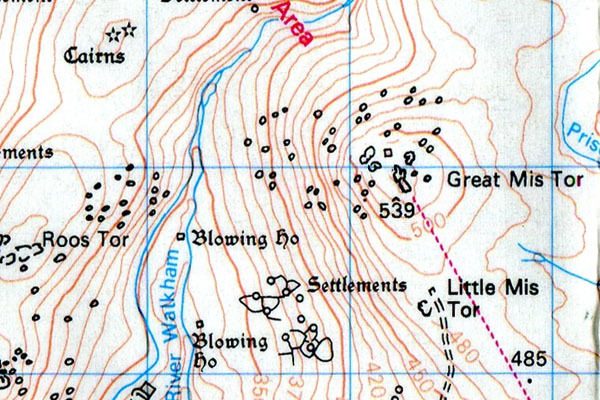 It is surrounded by history in the form of Bronze age settlements, Kistvaens and disused tin-streaming works, much obscurred by the bracken in the summer. Leigh Tor – Grid ref: SX 711714 Height: 180m a.s.l. Lints Tor – Grid ref: SX 580875- Height 496m a.s.l. Near to West Okement river valley and quite awkward to approach as part of a simple walk in, this tor is well worth the visit, with the potential for a good overnight wild camp and some easy bouldering if you get there on a dry day. 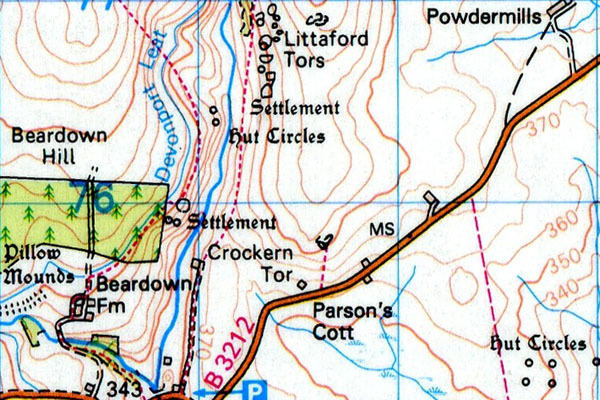 Littaford Tor – Grid ref: SX 616769 Height: 440m a.s.l. 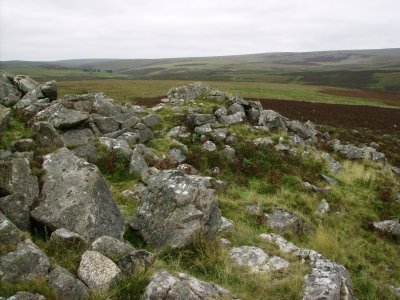 Part of Longaford Tor ridge. 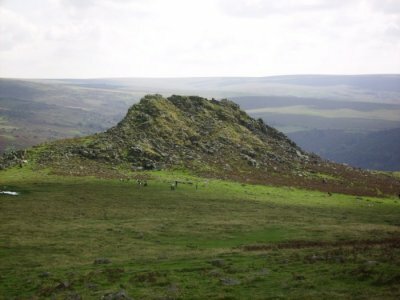 Little Hound Tor – Grid ref: SX 633899 – Height 492m a.s.l. Little Links Tor – Grid ref: SX 547870 – Height 510m a.s.l. On ridge leading to Great Links Tor. Little Mis Tor – Grid ref: SX 564763 Height: 480m a.s.l. 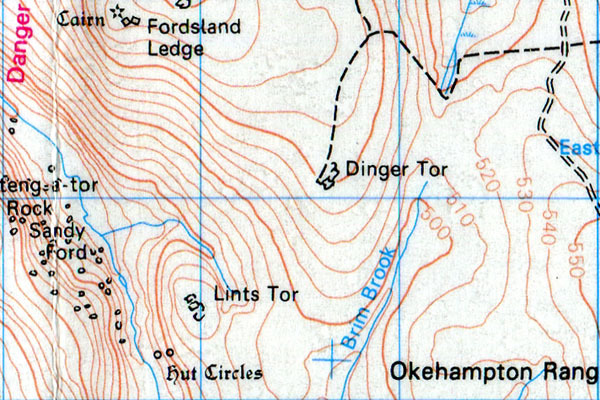 Little Mis Tor can be readily reached by track from the car park along the B3357. 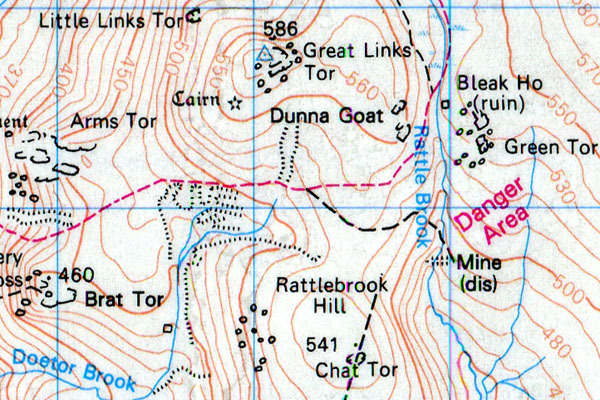 Standing prominently on the rising ridge-line of Great Mis Tor this tor is worth a close inspection, particulalry from those looking for some short challenging climbs or bouldering problems. 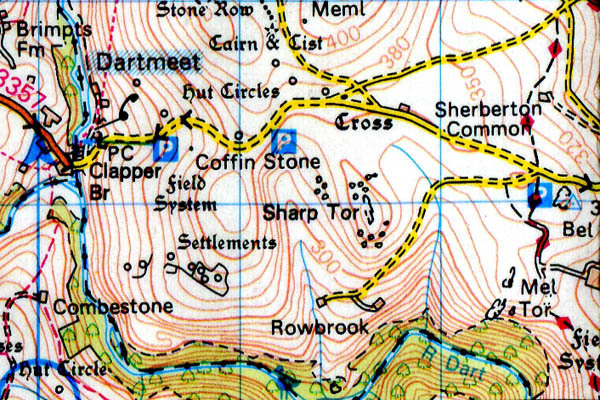 Check the Cairn out on the walk up, it appears to line up the Sunrise on mid-summers day and the Merrivale double stone rows western blocking stones. To extend the outing, push on to the top of Great Mis Tor where you will be able to get off the track and onto the real moor, from Great Mis Tor the North Moor opens up for an inspiring panoramic view. Little Staple Tor – Grid ref: SX 538754 – Height 380m a.s.l. 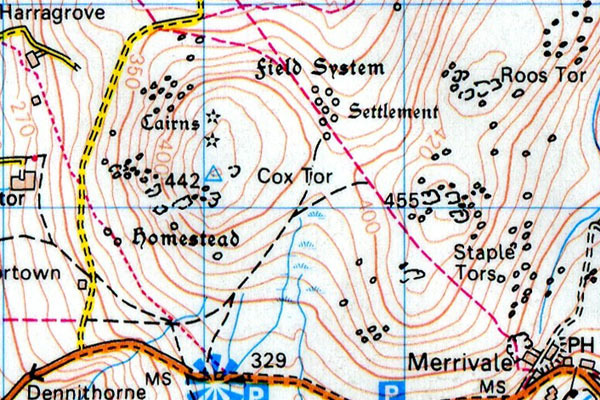 This tor is part of the ridge line that is dominated by ‘Great Staple Tor’ and to a lesser extent ‘Middle Staple Tor’. The tor is more noticeable from the ascent from the car park than when approached from above as the rocks are embanked intothe hillside. From Middle Staple Tor all that is recognisable is a large prominent flat boulder (see photo), which hides the south-facing craggy features of this tor. 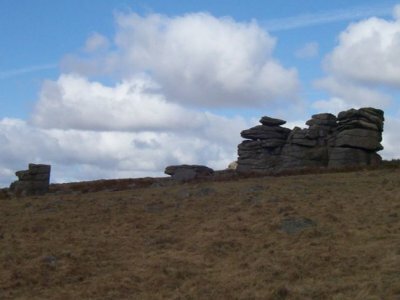 On close inspection you will see an array of large and impressive boulders making up this tor. Little Trowlesworthy Tor – Grid ref: SX 577646 Height: 330m a.s.l. 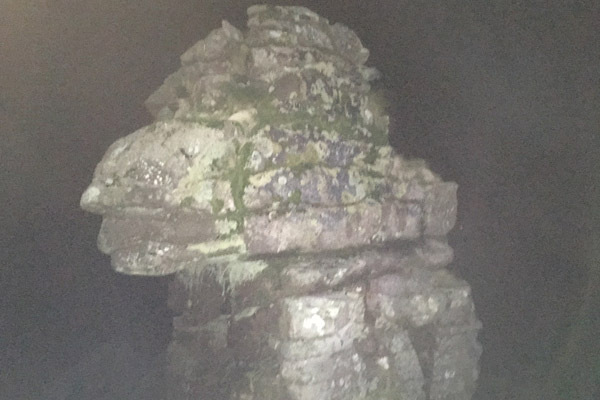 This tor is set amongst the ridge of higher Great Trowlesworthy Tor. Although known as ‘Little’ it is indeed not insignificant from its ‘Great’ cousin. To the North side is a small granite quarry with two finger spoil tips. The granite here is a Pinkish/Orange and very attractive. 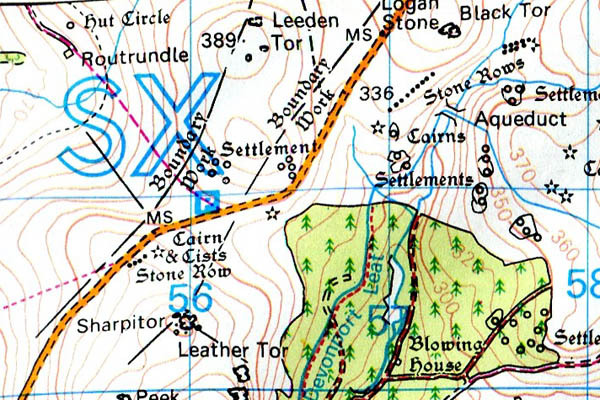 Between the two Trowlesworthy tors are a series of mason-shaped blocks, one of which has been shaped into a near-perfect cylinder. 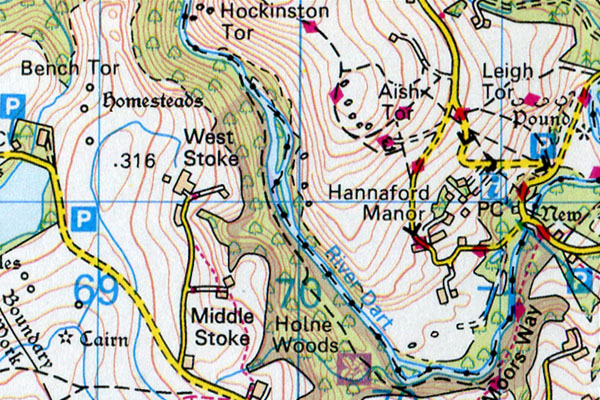 Easily reachable from Cadover Bridge (Near the Shaugh Lake China Clay Works), this tor is well worth a visit. 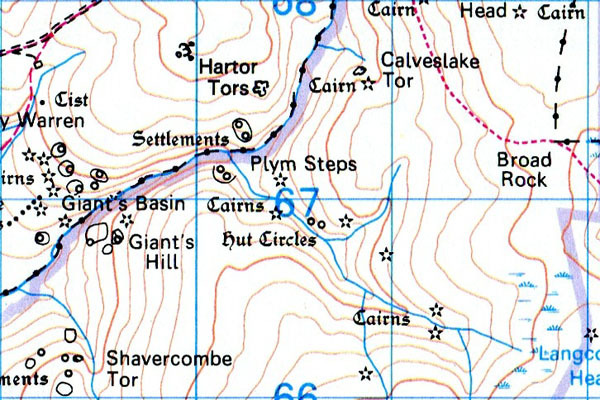 Longaford Tor – Grid ref: SX 616779 – Height 207m a.s.l. 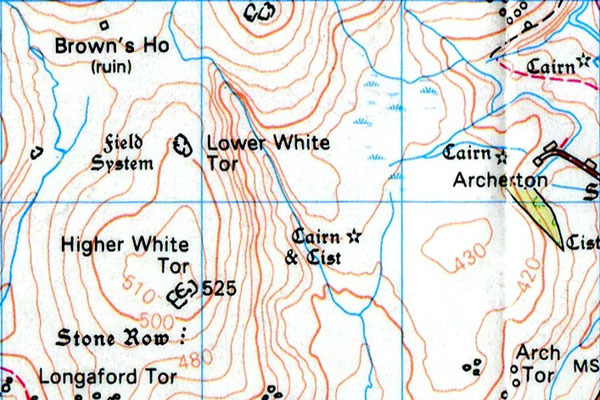 Lower Hartor Tor – Grid ref: SX 603675 – Height 390m a.s.l. Lower Hartor Tor provides a rambling set of low lying granite boulders of interesting shapes and distortions. A great place to view the rising sun of the morning or to view the beautiful Plym valley before an evenings wild-camp in the sheltered valley. Often frequented by dartmoor ponies and sheep. 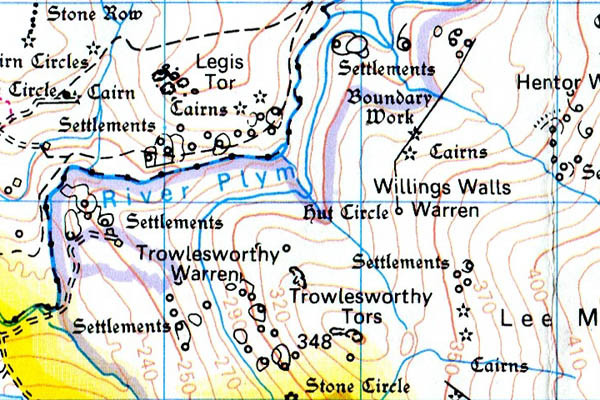 The whole area is worth a visit for the history that can be found in the form of dried-up leats, tin-workings, stone rows, cists, cairns & bronze age settlements. Lower White Tor – Grid ref: SX 619792 Height: 507m a.s.l. 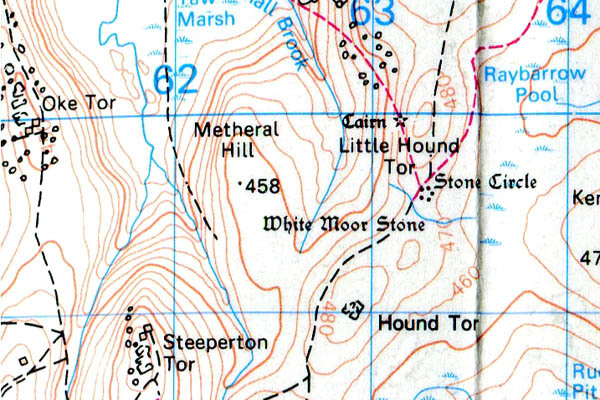 Luckey Tor – Grid ref: SX 685720 – Height 200m a.s.l. 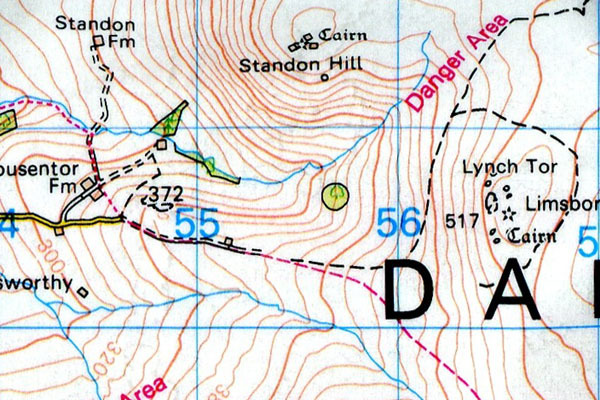 Luckey Tor is set low in a wooded valley. 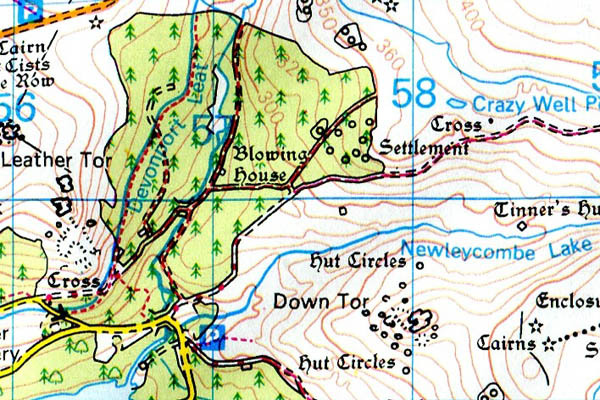 It can be identified on the 1:50k map series by the small crag feature by the river and below ‘Rowbrook’. It is a pleasant and sheltered Dartmoor climbing location. Lydford Tor – Grid ref: SX 599782 Height: 500m a.s.l. Lynch – Grid ref: SX 565807 – Height 510m a.s.l.